The nose has butterscotch, caramel and coconut alongside crisp smoke from a driftwood bonfire. The mouthfeel is thin with no cling. The body has dark chocolate, caramel, butterscotch and then a little of the smoke. The finish has caramel and butterscotch and then the crisp bonfire smoke from the nose. Water brings out tight, thin, compact whorling that dissipates before mottling. The nose gains more coconut and some vanilla ice-cream, and loses the caramel. The body gains poached pears and loses the dark chocolate. The finish is unchanged. 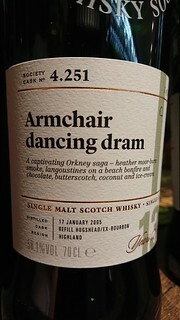 A very fine whisky, well balanced with the smoke and the sweet notes.